Hope you all enjoyed the Holidays. I hate to start off the year on a bad note, but I was recently sent a very disturbing video. Here’s the link: Anti Semitism on College Campuses. It’s a truly disturbing video. Here are some recent news stories about this topic: Rise In Anti Semitic Events At Colleges; Groups Urge Colleges To Protect Jewish Students; Swastikas Found At Emory University. Unfortunately, there are many more such articles. As noted previously, anti Israel sentiment has morphed into Anti Semitism. What a sad day for the American ideals of tolerance and acceptance. A healthy, happy and sweet New Year to all. I thought the first blog of the new year should be peaceful and light. Although there is mounting tension around the globe, and maybe because of that, we spend lots of time in the kitchen. After all, we are not just a people of the Book. We are a culture that values traditions and much of the tradition is tied to the kitchen. 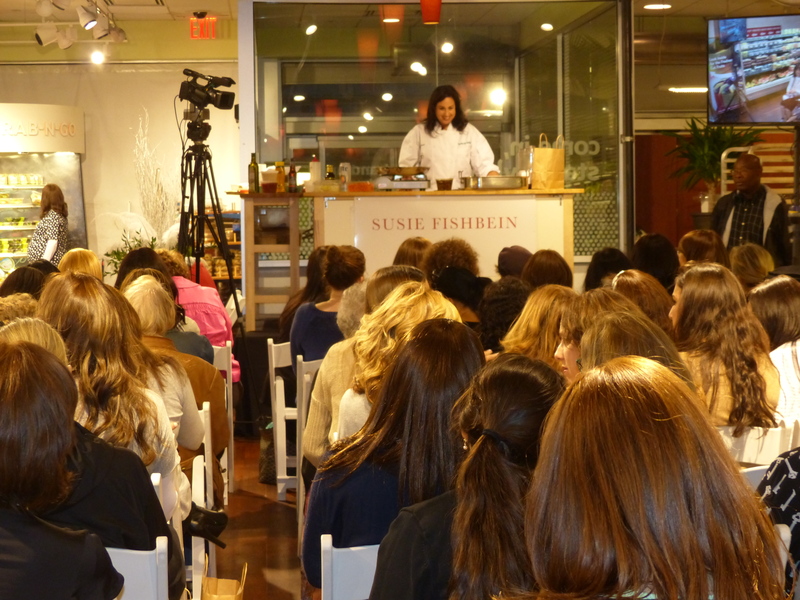 It’s not surprising, therefore, that more than 100 people gathered on September 30, 2014, at Pomegranate in Brooklyn NY, to learn from Susie Fishbein, author of Kosher by Design Cooking Coach and a number of other cookbooks. Pomegranate is just like any other upscale Brooklyn supermarket, but with one important distinction. Like others, it has a large selection of take out foods -from soups, to sauces, to main courses- for those with little time to cook, For the cook who wants to put it all together but has little prep time, Pomegranate features fruits and vegetables already washed, diced, and sliced and ready for use. But, unlike the others, the entire store is 100% kosher. As a service to the community and to its shoppers, Pomegranate offers occasional free educational cooking demonstrations, This past Tuesday night, about a week before the Sukkkot cooking marathon, Ms. Fishbein delivered a 45 minute cooking presentation filled with down to earth real talk, lovely and delicious looking food, explanations that even a novice could follow, and Q & A session. 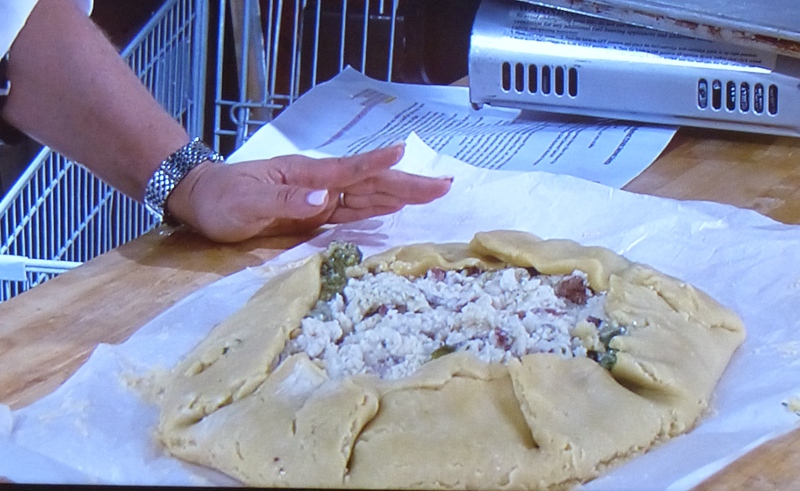 Ms. Fishbein showed us how to make Asian Mushroom Top of the Rib, Dried Fruit & Quinoa Stuffed Capons, as well as a Roasted Garlic Mashed Potato Spinach Galette. If you, like many in the audience, don’t know what a galette is, it’s a round flat pastry or pancake filled with vegetables, meat, or other foods, similar to a tart. 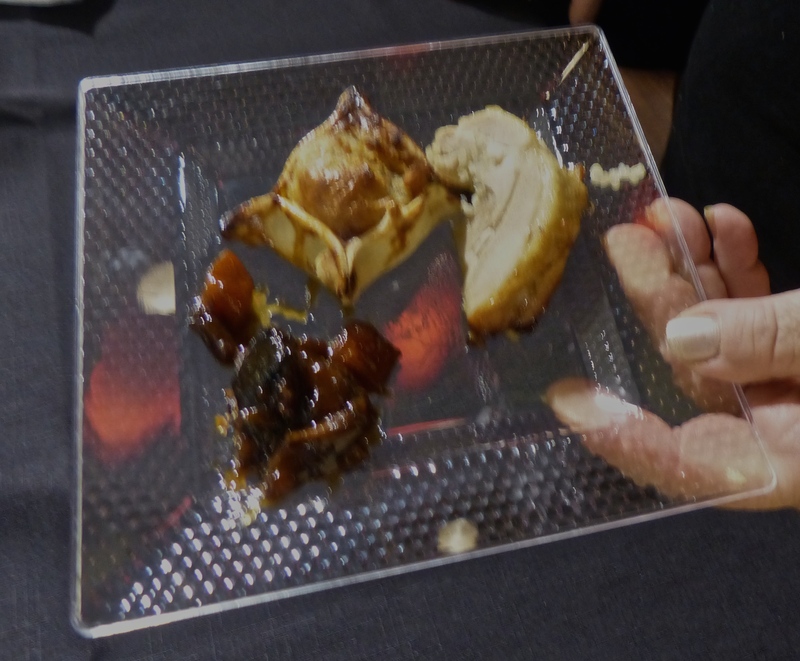 At the end of the presentation, everyone got a tasting plate of the three dishes she had prepared. To make replicating these recipes even easier, aisle numbers for the food items used in the demonstration were listed on the recipes.